From ADAPT. Photo by Tom Olin. WASHINGTON, D.C. -- Building on momentum from a nonviolent civil disobedience action at the Obama White House Sept. 20, which resulted in the arrest of 16 people, 300 members of ADAPT today have stormed the headquarters of the U. S. Department of Housing and Urban Development (HUD) on Sept. 21. ADAPT, a national disability rights action group, is demanding that HUD and its Secretary, Shaun Donovan, be held accountable for resolving the dire housing crisis faced by low income people with disabilities and seniors. "People have got to understand that for thousands of people with disabilities and seniors, freedom to live in the community means having both a place to live and community-based support services. They go hand in hand," said Cassie James Holdsworth of Philadelphia ADAPT. "You have the civil right to be able to live in your own community, and not be stolen away and shipped off to a nursing home or institution." ADAPT plans to make several concrete proposals to HUD to improve its housing. Those proposals include increasing the number of accessible public housing units; reform of funding streams that would promote construction of integrated, not segregated, housing; define a "home" as not more than 4 unrelated people living together; increase public housing vouchers for people with disabilities who want to leave nursing homes; and perhaps most creatively, expand the definition of "homelessness" to include all people with disabilities and seniors with disabilities now in nursing facilities. "The forced segregation of people with disabilities and seniors rests significantly on the failure of the federal government to adopt mechanisms to increase affordable, accessible, integrated housing," said Bruce Darling of Rochester ADAPT. "HUD needs to be accountable for 'disappearing' our people and hiding us from the public by continuing its practice of programs that promote segregation." 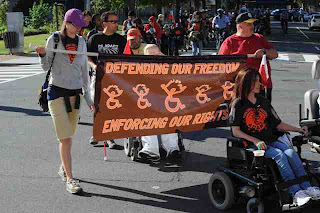 For 30 years, ADAPT has been recognized as an international role model in the struggle for disability rights, having helped to inspire nonviolent civil disobedience disability struggles as far away as Europe and South Korea. "Today, we literally have observers around the world watching us fight for social change," said Rachel Siler of Chicago ADAPT. "Not only the White House but HUD should be part of that change with us.